Michael Ondaatje, originally uploaded by johnwmacdonald. 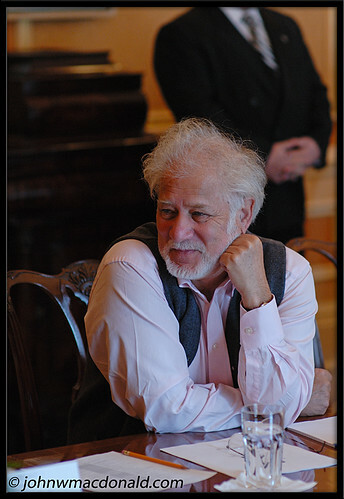 GG Literary Award winning author Michael Ondaatje was one of the 33 invited participants at the Art Matters conference held at Rideau Hall 13 December 2007 in conjunction with the Governor General's Literary Awards. I am so glad I did not have to pull out my sketch book this time around. The content of the programme's discussion revolved around three main areas: literature and commitment, literature and commerce, and finally, literature and communication. Her Excellency the Right Honourable Michaëlle Jean (and her husband, both being true to their passion for the arts) began the event by saying, "We see this institution as a place for dialogue, reflection and sharing. We want to throw its doors wide open to new ideas and current events, and for creative thought to flow through its historic hallways." Great photo! Next to the joy of seeing a friend win the Griffin, being on the dance floor and dancing just a few feet away from a dancing Ondaatje (we were dancing near, not with) was definitely the highlight of being at the Griffins a couple years back. I'm such a fan. Pardon me, that was in 2006, just last year. It seems so long ago now.